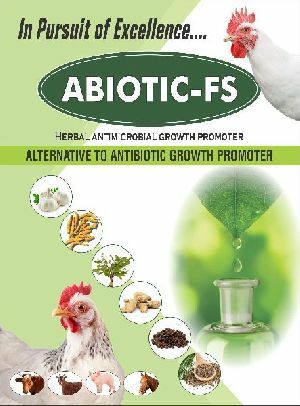 Abiotic-FS is developed as better and safer alternative for such antibiotics and chemical growth promoters. It has lower MIC as compared to Zn - bacitracin and other synthetic antibiotics. 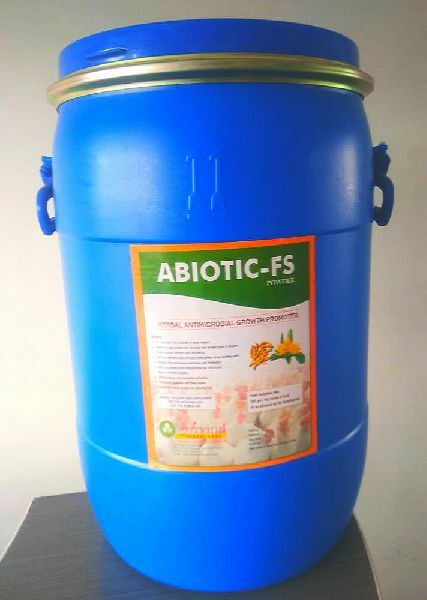 Abiotic -FS has better antimicrobial growth promoting effects. Abiotic-FS increase the population of beneficial microflora in the gut through its Prebiotic oliposaccharides. prevents irritation of the intestinal lining and increases the number and height of the intestinal villi. Abiotic-FS is a herbal anti-microbial feed supplement specially formulated for improving FCR along with growth promotion and performance enhancement in Animal and Poultry boosting immunity is the first and most important benefit of Abiotic-FS Abiotic-FS Contains anti-oxidant properties that improve health and fight dangerous diseases. Fight against viruses and influenza. Inhibits bacteria and viruses from penetrating healthy cells. Reduce the incidence infections and mortality. Kills microorganism responsible for infections. Boost immune system. Breaks down accumulation of toxins. Increases appetite and feed intake. Improves meat quality by reducing fat. Increase egg production in layer and weight gain in Broiler. Feed inclusion rate : 500 gm. Per tonne of feed. Or as directed by the Veterinarian.